It’s a lovely Friday afternoon in May, the Friday before a three day weekend (YES. ), and for some reason, it occurs to me that I want to make something. Something delicious. And celebratory. Because my birthday is this weekend. And for some reason, getting older is still a celebration? Not sure about that one. Anyway, I headed over to smitten kitchen in order to look for some recipes. 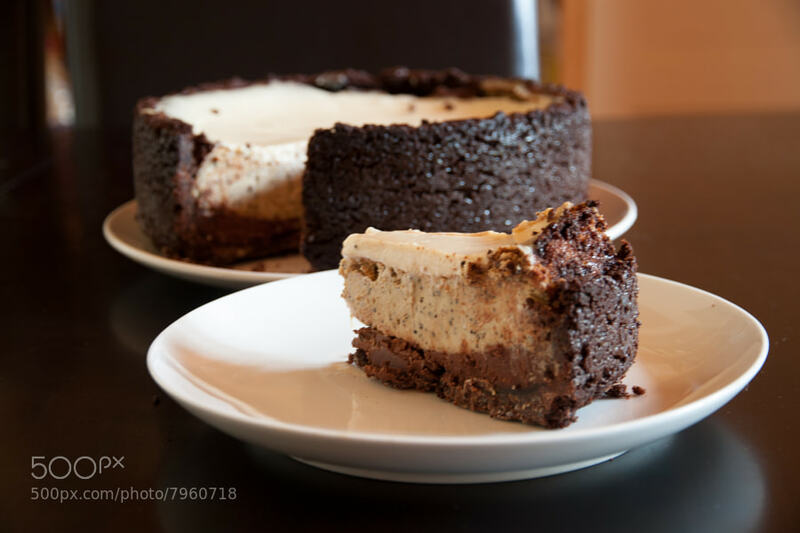 And I stumbled upon this lovely recipe: cappuccino cheesecake. Mouthwatering, to say the least. I began looking through the ingredients. 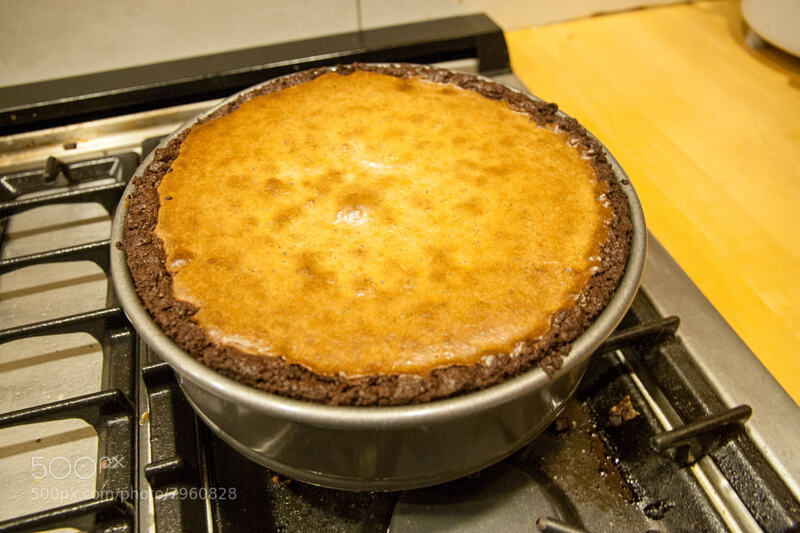 The recipe calls for the usual flour, sugar, butter, vanilla extract, and chocolate, plus the addition of some liqueur/liquor, rum, coffee beans, and chocolate wafer cookies. Lovely Deb has a good recipe for homemade chocolate wafers, but I decided that I was being ambitious enough with just the cheesecake. This is what I came up with. I have a love/hate relationship with Whole Foods. I love the fact that it has so many unique ingredients that I can try, and that I can get everything I want or need for a week of cooking there. Trader Joe’s is awesome for frozen foods, dried fruits, cheese, and bread, but it’s always so difficult for me to find something new and fresh to cook. But then Whole Foods has some pretty ridiculous prices on specialty items that really should not be marked up so high. I chose Whole Foods anyway, as it has a grinder right in store! Perfect for getting some ground espresso beans. I nabbed most of my ingredients, but for some reason, communicating my “chocolate wafer cookies” just wasn’t working out for me. I must have tried speaking to 5 different people about the cookies, but apparently Whole Foods had nothing like them. 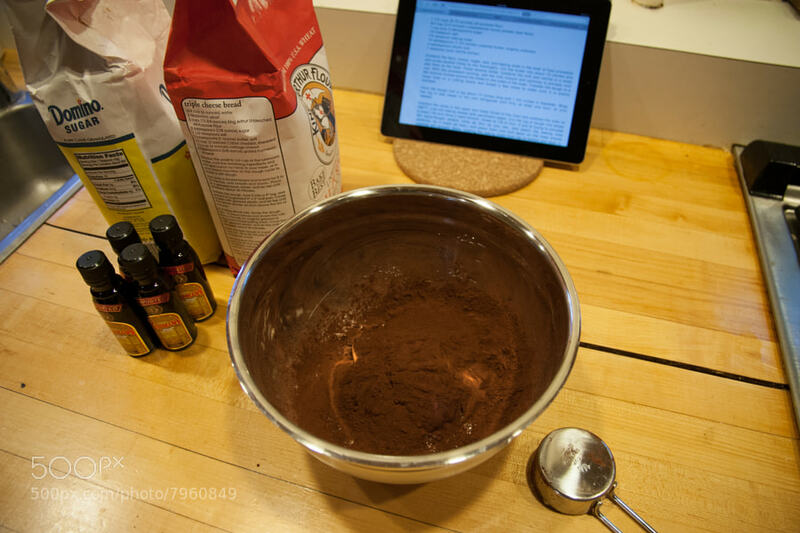 It was time for me to make my own cookies too (oh boy, add on another hour of work…). Not that I should complain; I got to make cookies the way I wanted them to be, and had some leftovers as well for a snack :). One quick note… I have never used a food processor for any recipe I’ve undertaken in my kitchen. 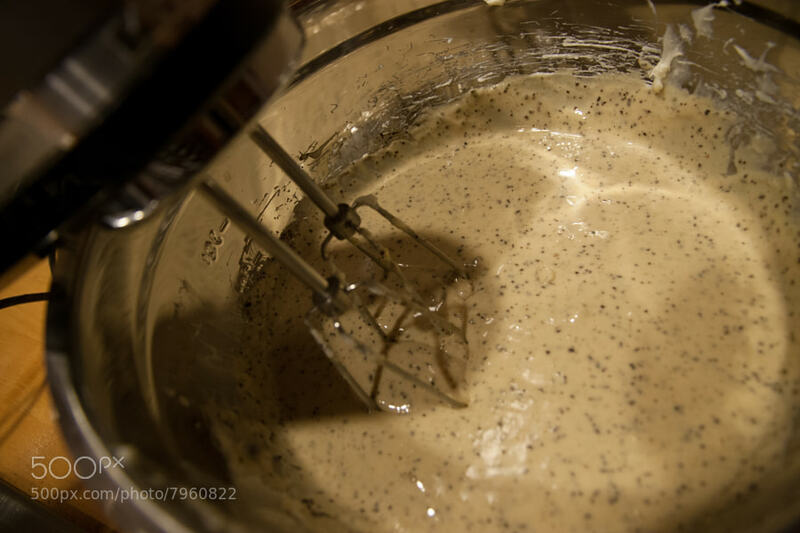 My nice little hand mixer has a doo-dad that does “blending” as well. I decided that this would make less of a mess and give me more consistency, although I had to put some pressure on each of my mixes and it took longer. It was quite the workout! I don’t know if the process would have been significantly smoother with a food processor (I’ll bet it would have been), but I survived without one. First up, cookies. These are known as icebox cookies, which are cookies made from dough that is refrigerated/frozen (doesn’t really matter which) and usually come in a log, so you can slice them before putting them on a baking sheet. 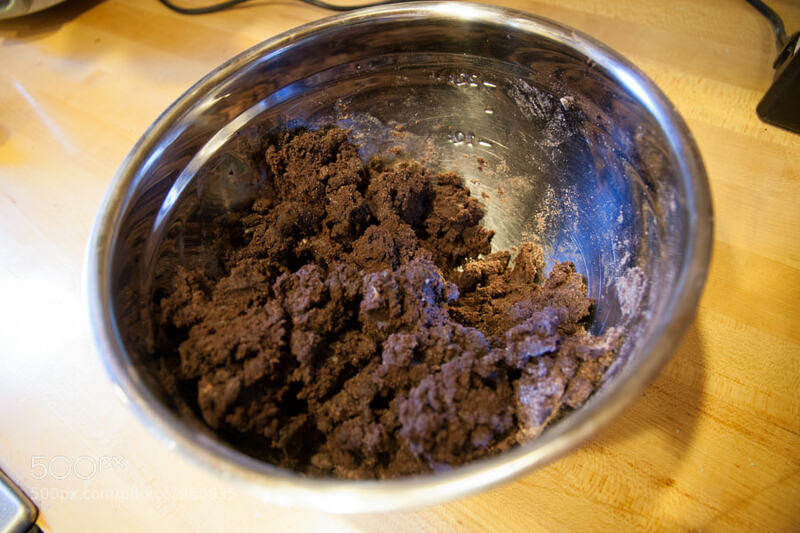 There are no eggs in this specific cookie recipe too, so it’s just a bunch of flour, cocoa powder, sugar, salt, and baking soda for dry ingredients, then some butter, milk, and vanilla extract to give that dough-like consistency. Making the log was probably some of the most fun I had. Kneading dough is very therapeutic, as is mixing with a hand blender. 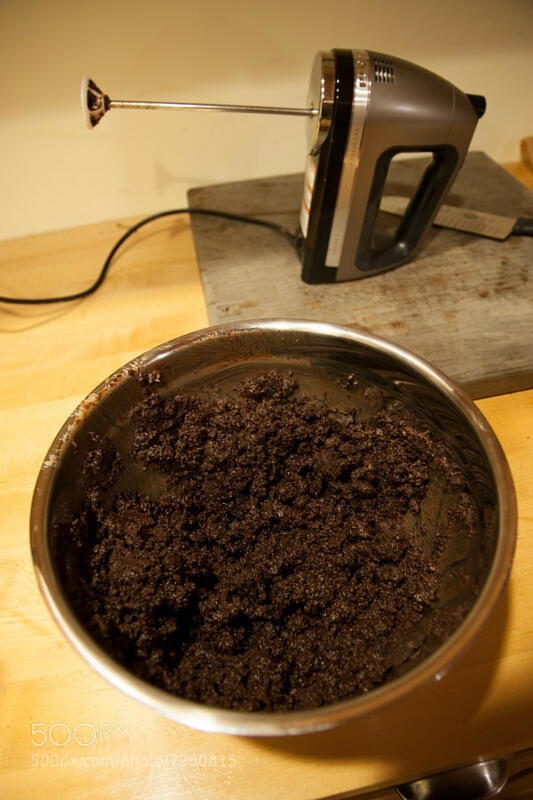 The recipe was pretty simple… dry ingredients, then wet ingredients, and then mix together. I actually cooled the log in the refrigerator for an hour, as opposed to the half hour. A friend of mine, Janice Wang, suggested using the freezer next time. Next time, for sure. 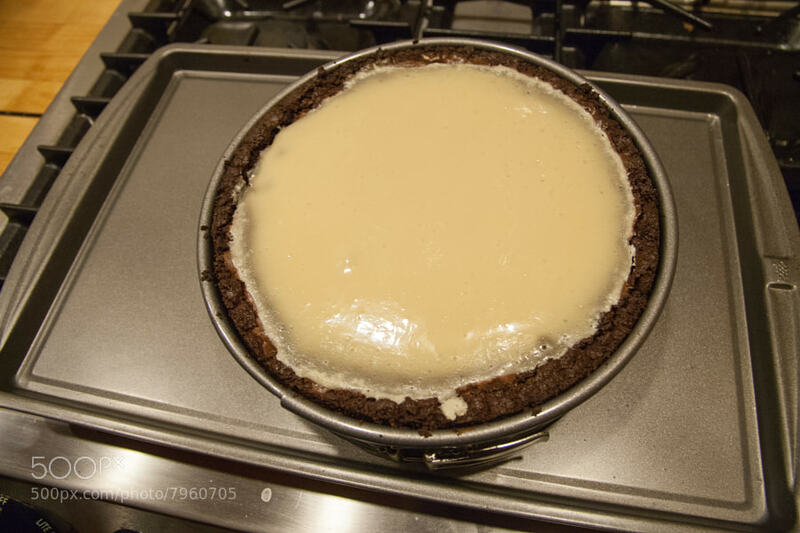 While waiting for the dough to settle into its log, I decided that I would start making the filling for the cheesecake. Wonderful cream cheese, notes of delicious espresso grinds, perfection. The recipe calls for adding eggs one at a time, and I guess this helps with the consistency of the cake not being too runny, but I didn’t worry too much about it. Blend it well, blend it quickly, and it should come out just fine. 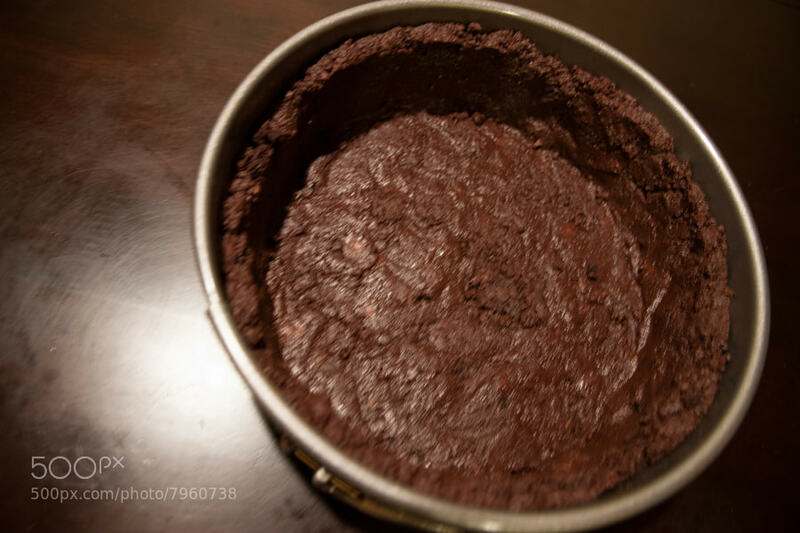 The ganache needed the same kind of quick blending/whisking, but it came out quite beautifully. The tad bit of Kahlua is a nice little flavor addition also :). 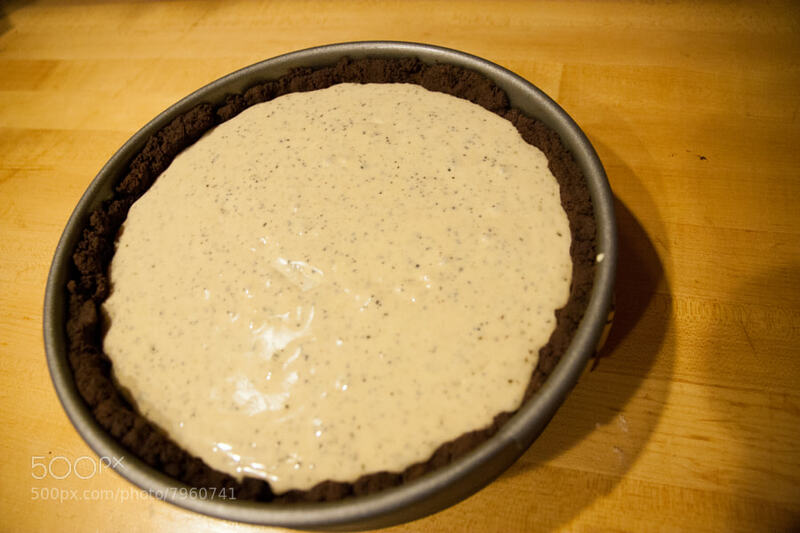 The filling went into the refrigerator while I made the crust, and the ganache was ready when the crust was ready. The crust was a whole other story. After cutting the logs, cooking for 16 minutes (switching racks halfway), and letting settle, the cookies came out quite well! Hard to mess up, like I said. But then… I didn’t have a kitchen scale. I know, this is probably one of the few items I SHOULD invest in, but I haven’t gotten there yet! Soon, especially after attempting the crust… Since I didn’t have the equipment, I may have guessed what 9 ounces looks like in cookies… and I definitely guessed wrong the first time around. The mixture was too buttery, too wet. It should have tipped me off, but it took until I tried putting it into my springform pan that I realized that I needed more cookies. So more cookies went in. About 60-70% of the dough that I made. The second round was much more successful, if I do say so myself :). 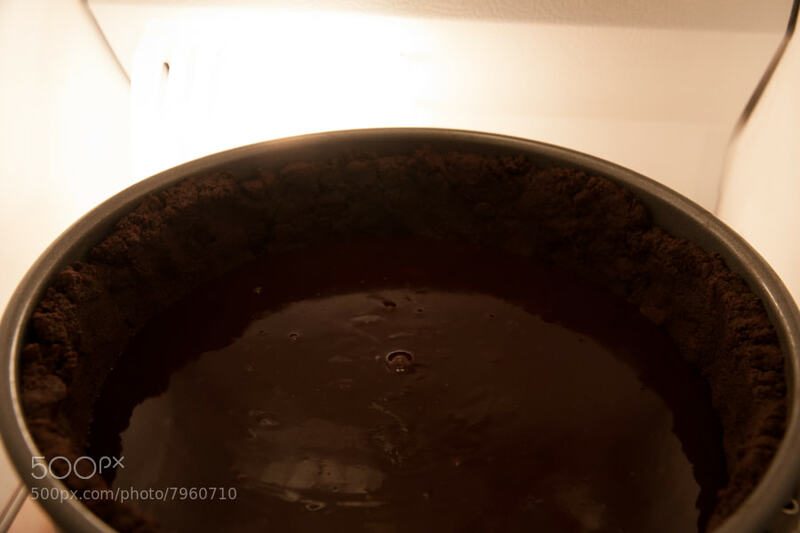 After the crust was settled, then the ganache was whisked, poured in, and put into the freezer to cool down. The recipe calls for an hour, I extended this to about 75 minutes and was happier with the turnout. This trend held true for the rest of the recipe. I poured the filling in, then baked for 85 minutes before I was happy with the turnout. filled up to the edge of the crust! The brown edge of my cheesecake hadn’t cracked, but I liked the color, so I took it out. I did some quick whisking of sour cream, sugar and vanilla, and topped it all off. Almost didn’t fill the entire cake, but it was just enough to give my cake a nice little top level. I baked it for about 20 minutes, then decided that it was bedtime and in to the freezer it went! The next morning, I woke up to find that there had been some cracking! Apparently very typical with cheesecakes, although mine cracked along the crust… This is probably due to the fact that I just fell asleep after putting it in the freezer, not waiting the hour to release it from the springform. Ah well, it tastes just as delicious! 2. Make sure to release the cheesecake from the springform after an hour of chilling! This will help prevent the cheesecake from cracking along the edge. 3. Be sure to leave enough time for the ENTIRE recipe, including cooling times. That means leaving about 7-8 hours, at the pace I was going, but I think you can probably cut that down to 5 or 6 with appropriate planning. 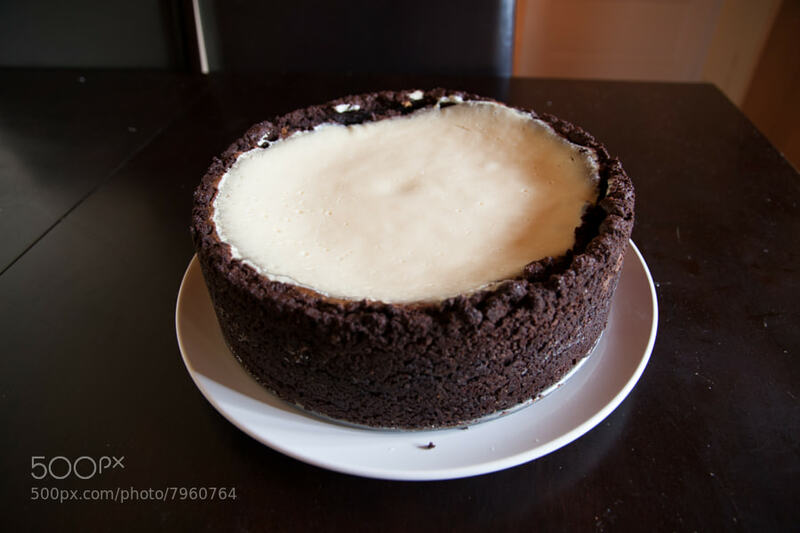 Now… back to my delicious cheesecake! MW27 Create a free website or blog at WordPress.com.